What is autumn to you? Is it clean crisp air with a hint of your back yard bonfire? Maybe a pumpkin spiced latte you’re pairing with your favorite flannel? Or maybe an orange colored ale brewed with just the right taste of fall. Lucky for you, these once a year flavors can all be found amongst our locally-owned breweries. Pull up to this brewery and you will immediately notice its sleek industrial guise; forewarning you though this is a no pumpkin spice zone. Coelacanth [ see-luh-kanth] is defying the pumpkin spice craze and has created a Caramel Apple Pie Porter which will have you thinking twice about those cinnamon rimmed beers. “Apple is the new pumpkin” claims president & CEO Kevin. This seasonal collaboration (Parkway Brewing, Richmond, VA & Bold Rock Hard Cider, Nellysford, VA ) uses fresh Virginia apples to create that malty, caramel brown porter exclusively made for the Virginia Coastal Autumn. Known for their artistic beer cans, this brewery was among the first to kick off craft brews in Norfolk. Smartmouth is shattering expectations of a fall flavored beer one small sip at a time. Outta Yer Gourd Pumpkin Ale will have your taste buds in a whirlwind of cloves, nutmeg, cinnamon and ginger! Not a pumpkin beer kind of drinker? Don’t fret, their copper lager, The Princess Oktoberfest, will be sure to suppress those autumn beer cravings. The beers on tap are not the only thing rotating at this brewery, different local artists design chalkboard masterpieces that add to this breweries uniqueness! Tucked away in the upcoming neighborhood of Chelsea, this veteran-owned craft brewery will have you feeling like a local in no time. Their extremely welcoming demeanor is contagious! Local tip, small batch releases are a weekly occurrence at this beloved brewery. Head on over every Thursday to experience a one of a kind brew, but don’t be late for it only lasts until the keg is kicked! Can’t make it on a Thursday? Don’t stress; their revolving draft selections are equally as flavorful. Bold Jack Pumpkin ale their favored fall brew, is a perfect drink to kick start those autumn adventures. Just outside of Ghent lives a Chesapeke Bay themed microbrewery. Their once four tap menu has now more than doubled offering many much loved brews. 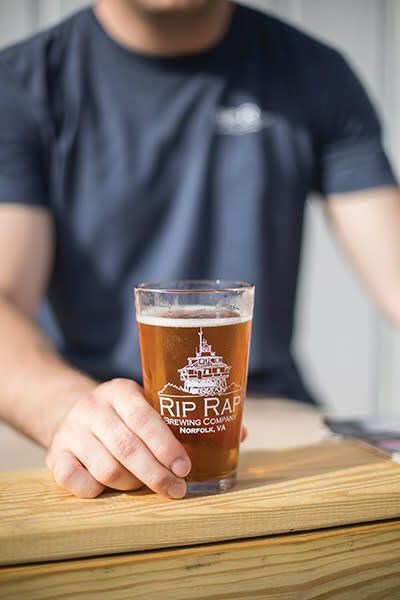 Oktoberfest is in full swing and what better way to celebrate than prosting with Rip Raps Marlin Spike Berliner Weisse. Its light bodied, refreshingly tart Berliner Weisse style ale brewed with just a touch of classic German hops will have you visualizing Oktoberfest! O’Connor’s is on the larger scale of breweries here in Norfolk, but a microbrewery nonetheless. Imagine yourself snuggled around a camp fire, soaking up that smoke kissed air, and listening to the crackle of the fire. O’Connor’s has taken this fall favorite activity and transformed it into beer. Literally, Backyard Bonfire Smoked IPA is on tap right now! Another fall favorite is their Squibnocket Apple Cinnamon Saison, a colder take on warm apple cider. In the heart of Norfolk’s NEON district exists a unique micro-brewery that gives a whole new meaning to local brews. Quarterly, Virginia home brewers compete for a chance to work with Bearded Bird experts, brew their homebrew in house and to top it all off the winners get to sell the yummy creation on tap! Back track for a moment, O’Connor’s bonfire brew left you craving a s’more am I right? Taste it to believe it but Randy Rook Red Ale tastes like a bottled up s’more! Its vanilla marshmallowy sweetness will have you begging for more! Just when you think we have covered every fall flavor thinkable, Benchtop Brewery takes it to the next level. By no means a typical saison this tart sage butternut squash beer (locally grown butternut squash to be more specific) is stealing the pumpkin ales spotlight! Sage Conclusion as they call it is a perfect mixture of earthy flavor with a touch of sweetness. Next on draft, they have Wicked Lobstrosity! With a unique name comes a unique brew, cacao nibs (from our friends at Videri Chocolate Factory, NC), coffee beans (from our coffee wizard neighbors in Ghent at Café Stella) and lots of shredded coconut! Catch on to how supportive this brewery is of their local community, amazing isn’t it?